...buzzy ones not so much! The easiest review ever to write would just say it works as claimed. Period. Except you still wouldn't know the what, the why and the how much of it. This assignment began with pure self interest. 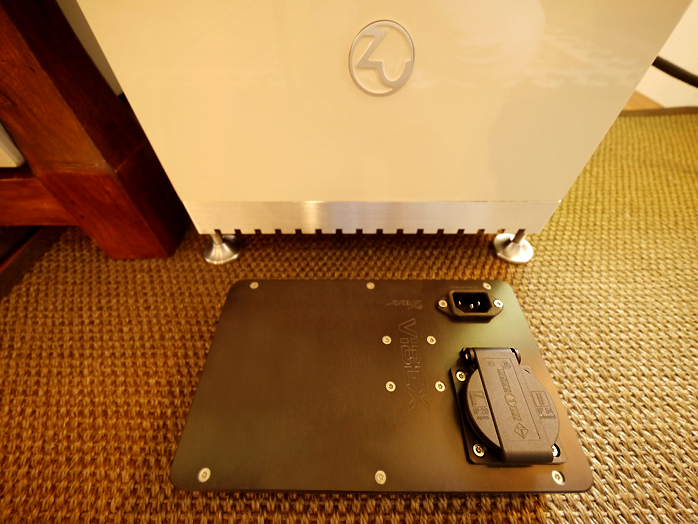 I'd acquired Zu's enormous Submission subwoofer which runs off a fully enclosed Hypex plate amp. And I'd noted how, sporadically but annoyingly so, its transformer would go buzzing for a stretch only to become inaudible again. Because the buzz ping-pong'd between nada and mega—loud enough to hear in the listening seat when on—I was sure that my utility power carried DC whenever the iron went off. DC on the AC causes transformer cores to saturate. 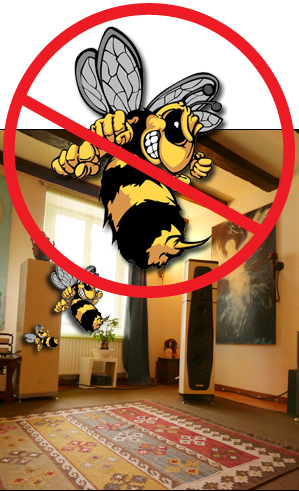 Major or minor buzz can be the outcome. I needed my own DC blockade. My otherwise very good GigaWatt conditioners don't include DC filters. Who ya gonna call? I only knew of one such commercial ghostbuster. 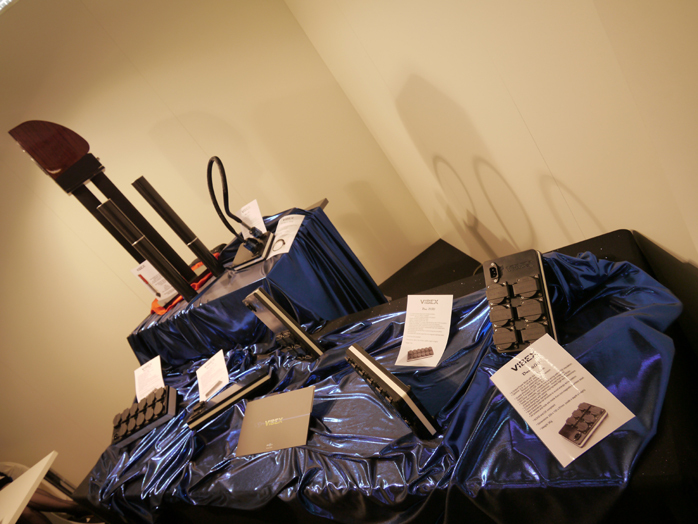 Marja & Henk had reviewed Isotek's EVO 3 Syncro. It had handily solved their own hum. Except my email inquiries to its maker fell on deaf ears. Or a spam filter. In either case I needed a whole new bag of cheap tricks. Nagra's Matthieu Latour to the rescue. When I mentioned my situation, he recommended Clifford Orman, UK export to Ciudad Real in sunny Spain. His Vibex power products are what Nagra use in-house. If it was endorsed by Nagra—whatever they don't like, these folks engineer themselves—it'd be good enough for me. Cliff's name rang a bell too. I checked our archives. 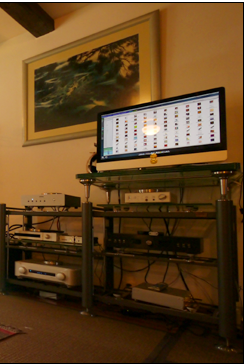 Sure 'nuff I'd mentioned him in passing in my review of the tiny Kiso Acoustics HB-1 speakers. As their importer Cosmos Hifi he'd designed a special stand for them from a synthetic porcelain that's called Krion (actually a patented combination of very fine bauxite powder aka aluminium ore and acrylic resins). Cliff found it to exhibit excellent anti-vibration and energy dissipation properties. In conjunction with carbon-impregnated elastomerics this stuff also forms the case-by-case basis for his various power-delivery building blocks. Clifford responded to my inquiry immediately. No mojitos on the beach. He suggested his Vibex Two 1R. That's a single i/o DC blocker with 3700VA capacity and >100dB RF/EMI attenuation. The whole block measures a mere 22x13x4cm, sports top-mounted Rhodium sockets and a black'n'white tri-layer sandwich construction with potted innards. My plan was simplicity itself. Plug the Submission into the Two 1R, that into the wall, then observe a full day dedicated to silence with just the sub powered up. I'd wait for the dreaded buzz to resurface as it cyclically had always done (though I hadn't the foggiest just what my neighbors were up to that caused these DC incidents in the first place - if that's what they really were). When the sub played it dead quiet for a full day—pax vobiscum—I knew not only that the Vibex worked as advertised but that cause for the buzz had indeed been the wrong combo of ACDC. All I had to do now was return this particular unit—knowing me to be in the EU, Cliff had dispatched one with Schuko power outlet whilst I use all US cords—and get one back with a 3-prong US outlet. That Two 1R will then go not just on Zu's sub but precede the passive GigaWatt power block which feeds my power amps. Those have never hummed audibly but ear on case still would get just a bit noisy whenever the sub signaled it was time for company. I might as well destress their iron too. And that's the whole review. I did promise easy. Humming trannies are quite common. And DC on the AC is getting worse. If you suspect to suffer from it, one English man in Spain has a very effective solution. You can get this benefit also in a 6-outlet version or 11-port DC + current filter. Since I already had a very good passive power distributor, I opted for the single unit. Clifford recommends I also get one for my source stack. Once my budget has recovered from the Munich show, I just might. I'll have to experiment with my first unit though to verify that I hear audible improvements there. As far as actual hum is concerned, I never had any with my source gear. But sometimes we don't know what we're missing until it actually does go. Missing. Low-level noise and its various intermodulation artifacts that is. Of course curiosity and this cat couldn't leave good enough alone so the story continued.